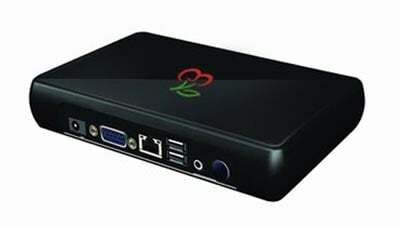 Check out this new tiny Linux PC which uses a tiny two watts of power, the Cherrypal Cloud PC. This tiny Linux PC features a Freescale 400MHZ MPC5121e mobileGT processor, there are also no moving parts in the PC which helped keep the power consumption down. The Cherrypal features 4GB of NAND flash memory instead of a regular hard drive. Memory comes in the form of 256MB of RAM , there is also built in 802.11b/g WiFi, two USB ports, a VGA port and Ethernet. The Cherrypal will run a tweaked version of Debian. There is no word on pricing or availability as yet, but according to the manufacturer they intend to make it the most affordable on the market.